This event will bring together experts from academia and industry to discuss the role of Carbon Capture and Storage (CCS) in Alberta's Energy Future. The Government of Alberta has recently set out $2 Billion worth of investment for CCS Projects to assist in the reduction of greenhouse gas emissions within Alberta. 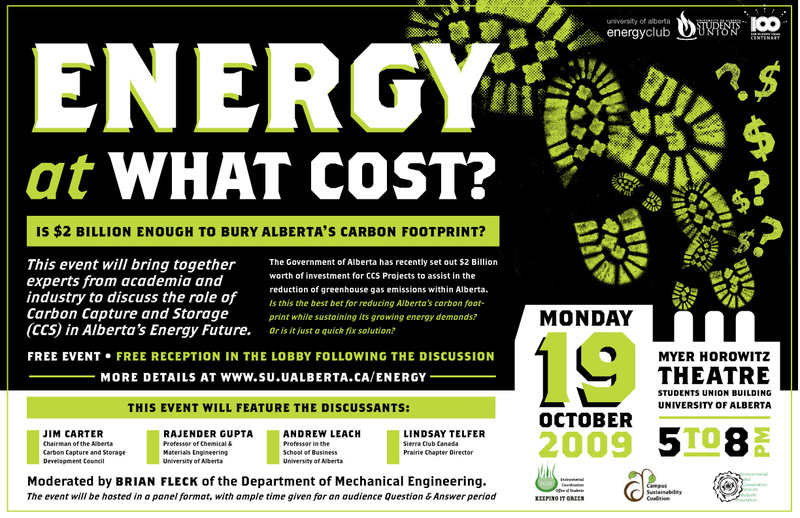 Is this the best bet for reducing Alberta's carbon footprint while sustaining its growing energy demands? Or is it just a quick fix solution? The event will be hosted in a panel format, with ample time given for an audience Question & Answer period. The moderator will be Brian Fleck of the Department of Mechanical Engineering. Following the discussion, there will be a reception in the lobby. Concurrently the poster session "Research and Art for Sustainability Expo" will be held, sponsored by the Campus Sustainability Coalition. This will showcase local art and research focused on sustainability issues. Prizes will be awarded for the best undergrad and graduate research posters and best sustainability themed art entry.